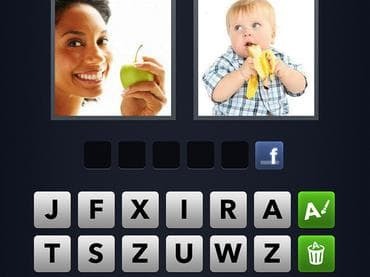 4 Pics 1 Word's gameplay is very simple: each level displays four pictures linked by one word - the player's aim is to work out what the word is, from a set of letters given below the pictures. Can you guess the words and unlock the levels? Countless puzzles from easy to tricky are waiting for you! New puzzles are added continuously for endless word fun! Если у Вас есть вопросы, связанные с игрой 4 Pics 1 Word пожалуйста используйте эту форму для связи с нами.